Trust Newway Towing for the Best Flat Tire Change in San Rafael! A flat tire has the power to ruin your plans and disrupt your entire schedule. It’s a domino effect: one slight delay causes another and another throughout the rest of the day, leaving you struggling to achieve everything you set out to do. Unless you give Newway Towing a call. We’re an experienced provider of towing and roadside assistance services in San Rafael, with a network of highly-trained technicians ready to change your flat tires quickly, efficiently and with the utmost professionalism. 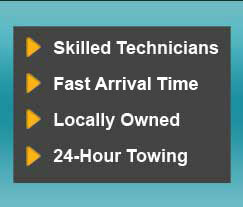 Newway Towing is dedicated to delivering unbeatable service in everything we do, from the smallest job to the biggest. Our flat tire change is a vital solution for drivers across San Rafael, whether your tire has blown from a puncture or is just long overdue for a replacement. And it’s available exactly when you need it. We’re here 24 hours a day, seven days a week to take your call, change your tire and get you back on your way. We believe in responding to you as fast as we can: this minimizes the length of time you have to spend waiting for help at the side of a road. That can be a tough situation to be in, especially if you’re by yourself, in a strange neighborhood in the middle of the night. But we’ll get to you quickly and safely at any hour, anywhere in San Rafael. Newway Towing’s network of independent tow truck operators are all trained to provide an extensive range of services, using the latest tools and equipment for maximum satisfaction. We only work with the most reliable technicians, boasting years of experience with towing and roadside assistance services in San Rafael. As they’re local, they know the area well enough to find the best routes and cut time out of their drive to reach you. Whether your vehicle is a car, truck or motorcycle, our technicians will be able to change your flat tires safely. You want to trust the tow truck operator replacing your tire. You want to feel your car, truck or motorcycle is in good hands at every step of the process. We know that. And that’s why we’re it’s so important that we’re licensed: you’ll have absolute peace of mind when you pick up the phone to call us. Over the years, we’ve changed flat tires for more drivers in San Rafael than we can count. Every single customer has received top service and been ready to get back on the road with their new tire, keeping any delay to their plans minimal. Newway Towing has earned an excellent reputation in the local community and is proud to be a trusted business. When you call Newway Towing, you know you’re in for a great deal. We only ever charge the price we quote — there are no hidden fees to worry about. We cater to all drivers in San Rafael, serving customers on varied budgets: that’s why we keep our rates so competitive. We’ll provide you with a cost and that’s what you’ll pay. Has your tire blown? Does it need to be replaced so you can drive safely and smoothly? Call Newway Towing on (415) 870-3377 now and we’ll get a licensed tow truck operator to you as soon as we can, no matter where in San Rafael you are!